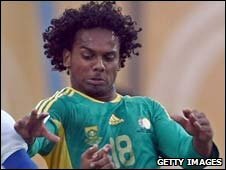 South Africa coach Carlos Alberto Parreira has included 19-year-old Kermit Erasmus in a 29-man squad for a pre-World Cup training camp in Brazil. The Brazilian coach also insisted it was 'not the end of the world' after the World Cup hosts drew 1-1 with lowly Namibia on Wednesday. Erasmus and Daylon Claasen, who both play in the Netherlands, as the only two foreign-based players in the squad. South Africa are heading to Brazil for a month long training camp next week. Bafana Bafana will also have camps in Germany in April and back in South Africa in May ahead of the World Cup that kicks off on 11 June. The hosts will play Mexico, Uruguay and France at the World Cup.